Accompanied by the reporter, we left San Antonio in the gray dawn of a summer morning. The reporter was going to Eagle Pass on professional business, and we agreed to travel together. First, however, it was necessary that the reporter should attend a barbecue, held some ten miles from the city. The doctor and I rode with him to the barbecue. There is a natural and uncontrollable tendency on the part of civilized men to get up picnics and barbecues. Every spring, for instance, men, women, and children flock out into the fields and forests, and afford a great deal of comfort to the hungry ticks and other insects that they meet there. The excursionists acquire freckles enough to last them during the remainder of the season, and they subsequently find themselves in the possession of a cutaneous disease, the effects of a poisonous vine; but that is not what they are after. The fact is, that people could not help going to picnics and barbecues, even if they wanted to stay at home. The desire is in the blood. The most civilized of men every once in a while rush out into the woods, and live like Indians for a few hours at least. The habits and customs of past generations will sometimes break out through the varnish of civilization. For instance: the domesticated dog of the present day, before lying down on a Brussels carpet, will turn himself around several times, and arrange imaginary dead forest-leaves, that he may have a comfortable bed. In his wild state, centuries ago, the ancestor of the modern dog went through these otherwise inexplicable manouvers; and his descendant instinctively clings to the habit. Feed him on the richest food from your table, yet, when occasion offers, he will go out into the fields, kill a sheep, and eat of the raw mutton, while at home he would turn up his nose at anything not properly cooked. So it is in the matter of barbecues. Doubtless, for thousands of years, man lived under trees, and ate the half-cooked flesh of wild animals; and, so long as man lives on earth, he will have an occasional yearning to return to his originally savage condition. This yearning finds expression in our barbecues and picnics. 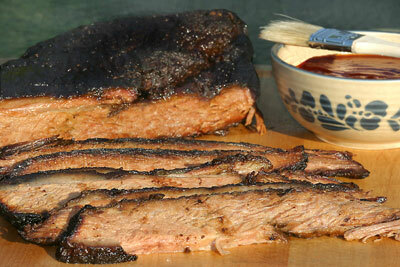 A barbecue is a festival the most prominent features of which are political speeches and roasted hog. 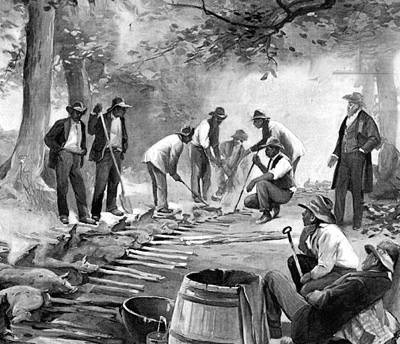 A barbecue is usually given by the inhabitants of some rural district desirous of giving candidates an opportunity to state, that, if elected, all their energies will be devoted to the interests of their constituents and the public weal, and that they pledge themselves, that, when their tenure of office shall expire, they will restore the high trust committed to their hands unsullied, etc. We arrived on the barbecue-grounds at about ten o’clock. More than two thousand people had already arrived, some from a distance of forty to fifty miles; old gray-bearded pioneers, with their wives, in ox-wagons; young men, profuse in the matter of yellow-topped boots and jingling spurs, on horseback; fair maidens in calico, curls, and pearl-powder, some on horseback, others in wagons and buggies. These, with a liberal sprinkling of howling, bald-headed babies in arms, made up the crowd that met in a shady grove on a hillside to participate in the barbaric rites of the barbecue. A stand had been erected for the speakers. Around it the ladies were provided with seats borrowed from a neighboring schoolhouse. To the left was a rough pine table, forming the four sides of a square, each side of which was two hundred and fifty feet long. It was calculated that one thousand people could at onetime dine around this “ample board.” At some distance from the stand a deep trench, three hundred feet long, had been dug. This trench was filled from end to end with glowing coals; and suspended over them on horizontal poles were the carcasses of forty animals: sheep, hogs, oxen, and deer, roasting over the slow fire. 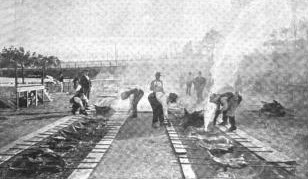 The animal being skinned and cleaned, the whole carcass is placed about two feet above the coals, and cooked in its entirety. 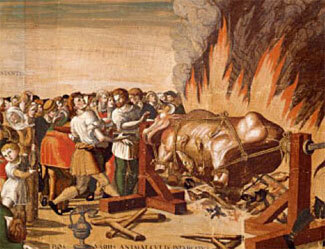 The process is slow, taking twelve hours to cook an ox. Butter, with a mixture of pepper, salt, and vinegar, is poured on the meat as it is being cooked. It is claimed that this primitive mode of preparation is the perfection of cookery, and that no meat tastes so sweet as that which is barbecued. 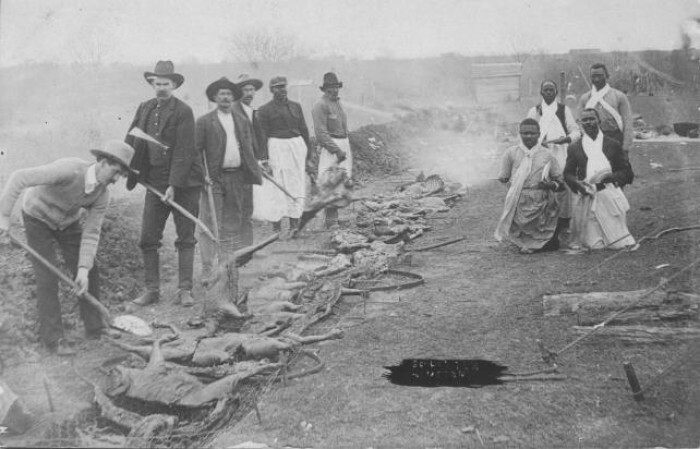 When sufficiently roasted, the carcasses are carried on poles, manned by stalwart negroes, and placed on small tables inside the square formed by the dining-tables. Here a force of carvers soon cut the meat into slices; others distribute it on plates, and arrange these plates on the long table, a huge slice of corn-bread being apportioned to each plate. That is all. The dinner is served. No long bill of fare to hesitate over; no knives, no forks, no napkins; nothing but bread and meat. Water in barrels was brought from a spring at the foot of the hill. These barrels placed around the tables at intervals, a single drinking-cup being attached to each, provided the guests with the only beverage allowed on the grounds. The ladies were admitted to the table first and dined standing up. The doctor was horrified to see an excited female leave the table, approach a male friend, and, after whispering in his ear, return to the table with a villanous-looking bowie-knife, ten inches long, in her hand. The doctor thought he detected fire in her eye, and intimated, that, if she were not quickly suppressed, blood would be spilled. But there was no murder in her heart. She merely borrowed the knife that she might cut her “chunk” of meat into reasonable mouthfuls. After the ladies had dined, the men were turned loose on the eatables. To see them, in their rude playfulness, scramble for a choice rib, the victor going off gnawing it; the unsuccessful one pouncing on a waiter carrying a large tray full of beef, and relieving him of his load in a second, forced one to think of one o’clock in a menagerie. There was enough and to spare for all the vast crowd; and I would be lacking in my duty as a veracious reporter of the event if I failed to say, that “the hospitable board fairly groaned beneath the load of good things,” etc. The dinner was free to all; and more than twenty thousand greasy fingers testified their owners’ appreciation of the eatables, and gave at least one-third of the guests a reasonable excuse to get off that venerable truism about fingers being made before forks. After dinner the speeches. The speakers were a general, a colonel, and a judge. The general was a candidate for the State Legislature; the colonel, for the United-States Senate; and the judge, for Congress. The young men made frequent excursions “to see the spring” at the foot of the hill. I never knew a spring so attractive, or one that received more attention. Some young men, and old ones too, not satisfied with one sight, returned several times to see the spring, and seemed to become more exhilarated, and more enthusiastic on the subject of its beauties, in proportion to the number of their pilgrimages. Perhaps the waters were of a medicinal character, or—but why conjecture? Doubtless those who have attended a barbecue could account for the phenomenon. From: On a Mexican Mustang Through Texas, from the Gulf to the Rio Grande, by Alexander Edwin Sweet and John Armoy Knox. Hartford, CT: S. S. Scranton & Company, 1883.